Published May 21, 2018 By Anna T. This post may contain affiliate links. Regardless, I only recommend sites I've researched and/or used and trust. Lyft is a popular ride-sharing company – basically like a virtual taxi service – that operates its business almost entirely over the internet through a cell phone app. 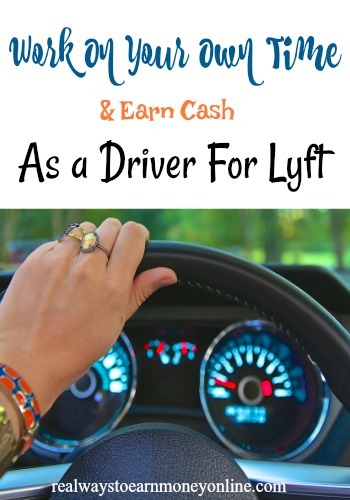 Becoming a driver for Lyft is fairly easy, all things considered, and it's increasingly becoming a popular way to make a part-time or even full time income. As a Lyft driver, you'll be dealing with members of the public for fairly long stretches compared to most other jobs. This just goes with the territory for any sort of taxi service, and people with certain personality types usually find this kind of work very enjoyable, at least most of the time. Some of the passengers will be really nice, or funny, or interesting. Others might be less pleasant to deal with. Obviously with any job like this, a certain portion of your customers will be people who've been drinking and can't drive themselves. This is one of the most valuable aspects of taxi services, and every time you handle a passenger who's had a few too many, you can take some satisfaction from the fact that you helped make it easier for someone to behave responsibly, and not drive while intoxicated. Because of all the varying situations you might encounter while driving, and because of the number of people you'll have to deal with, it's really an asset to have strong social skills if you want to tackle this kind of gig. But Lyft offers a few features that add some accountability to the process, and help you avoid awkward or unpleasant situations. Issues that crop up between drivers and passengers are handled via a two way rating system. After each session you'll be required to rate your passenger, and the passenger will have the to rate you. If you give a rating below 3 stars, you won't be paired with that passenger again, and the same applies if the passenger scores you below 3 stars. As a Lyft driver you'll be expected to keep your average rating (based on your last 100 rides) at 4.8 or above. If you slip too low, you'll need to make some improvements quickly, or else face the possibility of being deactivated. Low ratings also have consequences for customers. When a request goes out, drivers will see the star rating of the passenger, and have the option to pass on someone who's been very problematic in the past. From all reports the app itself is really slick, and does a good job of streamlining the process of finding passengers. Just turn it on, and switch driver mode to make yourself available. Ride requests are offered to nearby drivers one at a time. You have 15 seconds to accept a request before it's taken away and sent to the next closest driver. There's a built in GPS function that guides you to your passenger's location, and once you've accepted a ride request you just let the app show you where to go. Lyft can be a really nice side-gig or a full time thing, depending on how you want to approach it. Making several-hundred dollars for a few hours of driving is apparently fairly common, especially during peak times. Pay rate is calculated using a combination of different factors. The passenger is charged an initial fee to start the ride, and there are additional costs based on mileage and minutes. The actual dollar totals for each variable differ from city to city, so if you live in one of the big metropolitan centers, you'll presumably make more than someone who drives in a less popular or expensive location. Passengers can also tip, and you get to keep all that for yourself. If you do a good job, and make passengers feel comfortable, your tips could potentially make a big difference to your overall income. One of the great things about Lyft is that you can drive whenever you want. A lot of people just use it for some extra cash during their downtime, driving for a few hours a week. If you want to put in more hours, you certainly can, but there's a limit – you can only be on call for a maximum of 10 hours at a time. After that, Lyft will take you offline for a mandatory eight hour break. They, understandably, don't want drivers out on the roads when they're too tired to operate a vehicle safely. To become a Lyft driver, you'll need to be 21 years old, with an in-state driver's license that's at least a year old, a valid social security number, and an insurance policy for the car you'll be using, with your name on it. There are also a few requirements for your vehicle. It must have an in-state license plate, four external doors, five seat-belts, and it needs meet their vehicle age requirements, which vary from state to state. Really old cars might not be accepted in certain situations, regardless of how well they're running. There are some additional rules based on local laws that apply in certain locations as well. Lyft has a list of different regions at the bottom of this page, so you can check the laws in your own hometown. You need an IPhone or an Android phone that's new enough to run the app. When you sign up to be a driver, Lyft will run DMV and background checks to make sure you don't have a criminal record that might disqualify you. Then they'll put your vehicle through a 19-point inspection to see if it's up to snuff. Lyft is fairly popular these days so it wasn't hard to find plenty of feedback from drivers. I used Glassdoor.com in conjunction with several reviews I found scattered around the web to conduct my research. The feedback was overwhelmingly positive. For a company with over 1000 reviews on Glassdoor, 3.8 is a really good score, and the comments from reviewers generally reflect that. Drivers love the flexible hours, the slick design of the app, and the pay. Many also enjoy the chance to meet people and get out of the house while making real money in the process. Most of the negatives were related to the fast pace of the work, and difficulties driving in busy areas, which are things that go hand-in-hand with any sort of taxi job. If driving for Lyft sounds like the sort of gig you'd be interested in, and you meet all the requirements, go here for further reading, and submit your application online.